Place the rice into an oven-proof baking dish and sprinkle with a little bit of water. If desired, a few knobs of butter or a drizzle of olive oil can be added to prevent sticking and add flavor. Cover with a tight-fitting lid (or seal tightly with aluminum foil) and bake for about 15 minutes at 300° F (or 150º C). Place the rice in a heavy pot on the stove and sprinkle with a little bit of water. If desired, a few knobs of butter or a drizzle of olive oil can be added to prevent sticking and add flavor. Heat over medium heat, stirring gently and occasionally to prevent scorching. Reduce the heat to the lowest setting, cover and let the steam until the rice is completely heated through. 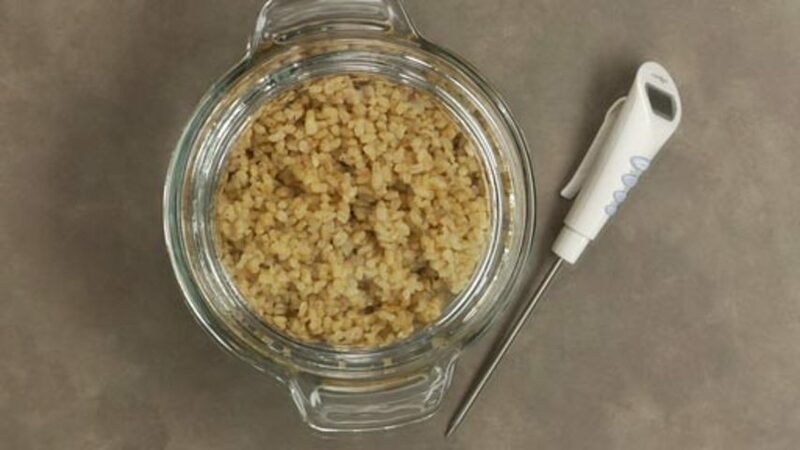 Place the rice into a microwavable dish. Sprinkle with a little bit of water. If desired, a few knobs of butter or a drizzle of olive oil can be added to prevent sticking and add flavor. Depending on the amount you are reheating, cover and microwave on high for approximately 1 to 2 minutes. Gently fluff the rice and return to the microwave for another 1 to 2 minutes or until all the rice is completely heated through. No matter which method you use to reheat rice, for food safety reasons, always make sure the rice reaches a core temperature of at least 165°F (74°C).